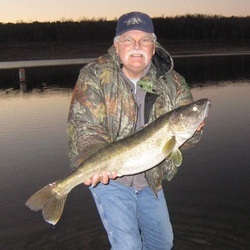 There are no closed fishing seasons on Bull Shoals Lake's 45,000 acres of water, or on the nearby White River. Bull Shoals is well known for it's "tackle-busting" fish: largemouth and smallmouth bass, Kentucky bass, walleye, crappie, bluegill and catfish. If trout are your sport fish of choice, we're only a few minutes from the White River where it is not unusual to catch 30 to 60 rainbows 12 to 14 inches long in a day. You'll also catch brown, cutthroat, and brook trout. Trophy browns of 4 pounds or more are common catches in the White. Located on the Howard Creek arm of Bull Shoals Lake our cove is one of the best fish-holding spots in the area. Whether fishing off our dock or in a boat, the fishing here is exceptional due to a channel swing with a 30' depth at one end, and a 12' depth on the other end. This formation holds fish well all year. Red Arrow's guests enjoy fishing from the deck located at the end of the boat dock. At night they sit on the benches and fish under the lights. 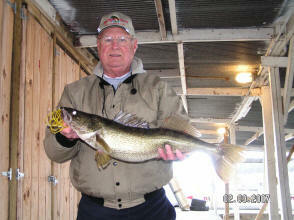 and caught the biggest walleye of his life! 34 1/2 inches long and 13 1/4 lbs just before dark on 4 lb test line.